Department of Art | Ringling Exhibits "Witness to War"
Home » News » Ringling Exhibits "Witness to War"
Ringling Exhibits "Witness to War"
The Ringling and the Institute on World War II and The Human Experience at Florida State University have partnered to honor World War II Veterans in an exhibition of photographs at the The Ringling Museum of Art. Opening June 21 in Sarasota, Witness to War will include a selection of photographs taken by service members who worked tirelessly, under duress, and often in harm’s way to record and produce a gripping visual account of World War II. Photographer Unknown, “Soldiers on Amtrac in Ocean”, n.d., The Institute on World War II and the Human Experience, Florida State University. The Ringling collection includes photographs taken by World War II veteran, Warren J. Coville, a prominent philanthropist and photographer, who recorded perilous bombing missions in action from his position within a B-17 “Flying Fortress.” These photographs are part of a recently donated collection of more than 1,600 images from the Warren J. and Margot Coville Collection. 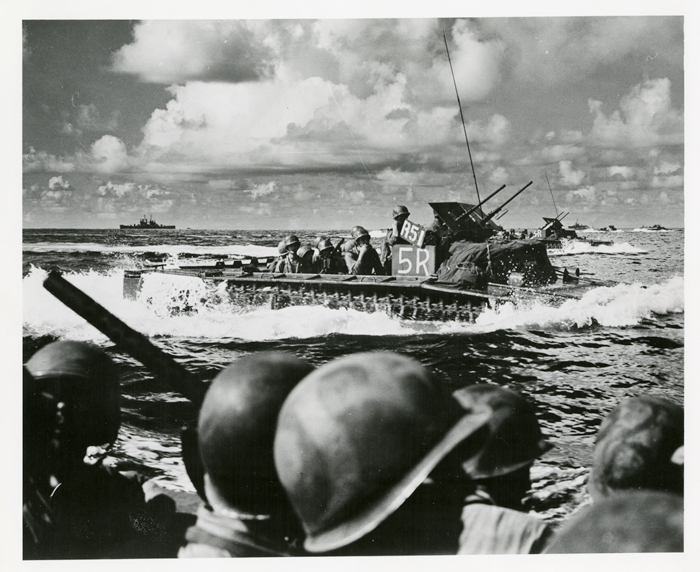 Photographs from the collections of six other veterans, on loan from the Institute on World War II and the Human Experience at Florida State University, give testament to the global scope of the war, as they document the service and sacrifice of GIs in the European and Pacific theaters. Resourced from a collection of over 6,500 photographs, these images include not only official military photographs, but also candid snapshots of war buddies, scenes of the destruction of war, and images showing the daily lives of GIs deployed overseas. Related programs include Gallery Walk and Talks on July 11 and August 1; a Viewpoint lecture on Saturday, June 15, with Kenny Irby, senior faculty for Visual Journalism and Diversity and Director of Community Relations at the Poynter Institute; and a Sunday film series in the month of August in the Historic Asolo Theater. For more information, log on to www.ringling.org. The Witness to War exhibition and related programming are part of Legacy of Valor, a campaign that rallies the Sarasota community to honor veterans, inspire patriotism and embrace freedom. A mosaic of community-driven partnerships will educate, build enthusiasm and focus the community to use time, talent and treasure to recognize the service and sacrifice of all veterans throughout the campaign and beyond. For more information, please visit www.patriotplaza.thepattersonfoundation.org.